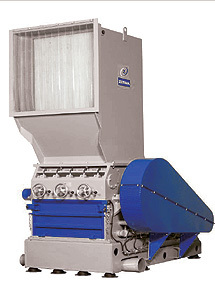 The ZERMA ZHM type hammer mill was specifically developed for materials that can- not be comminuted using conventional granulators or only with acceptance of extremely high expendable part costs and risk of breakage. Recycling of white goods, as a secondary comminuter downstream from a shredder, for improved opening up of the material and subsequently better sorting by type. E-waste, above all printed circuit boards, but also complete computers and mobile phones, etc. PVC sections from demolition with glass remnants, fittings, iron reinforcements, etc. Preparation and combination of wastes for biogas plants. ZHM series hammer mills are equipped with highly wear-resistant tools. The machine housing made of durable welded steel construction withstands the highest demands. The external storage, grinding tools and rotor shaft are oversized designed and therefore suitable for heavy applications. Rotor diameter is 800 mm with a rotor width of 1200 mm. The mill housing is lined in the upper and lower part in the wear areas with replaceable wear plates made from HARDOX. The counter-knife series are also designed in HARDOX.